What It’s About: A mysterious artifact, uncovered in Giza in the 1920’s, allows intergalactic travel. 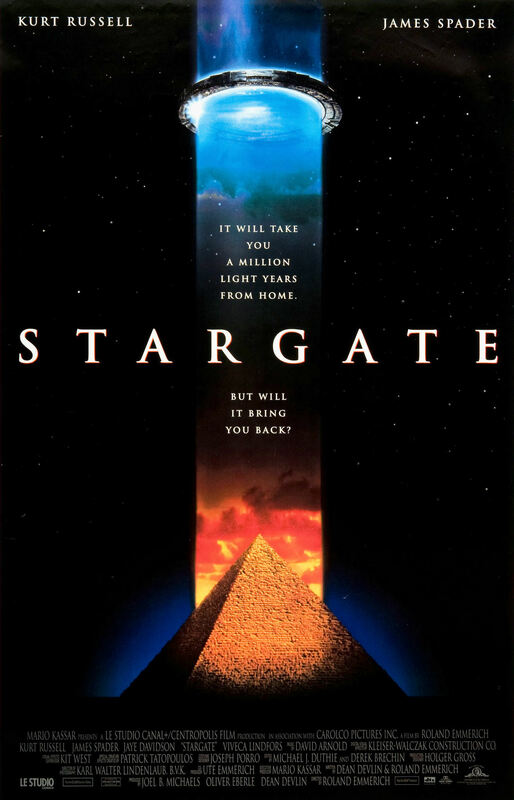 A team of special forces operatives (headed by Kurt Russell, in one of his more strait-laced roles) escorts a researcher (James Spader) to test out the portal; stranded on the other side of the universe, they then explore the seemingly Egyptian society they encounter on the other side. Unfortunately, a malevolent and technologically advanced alien has a nefarious plan for the powerful transporter, and our heroes must use their wits, brawn and knowledge of how to speak ancient Egyptian to incite a revolution and escape the machinations of Ra (Jaye Davidson, in his one memorable role after The Crying Game). Spawned an infinite series of spin-offs with, reportedly, more films to come in 2015. Why Watch it Today? : On February 16, 1923, Howard Carter and his dig team opened the burial chamber of the tomb of Tutankhamen. Carter’s bold trespasses spawned a raft of myths of vengeful mummies’ curses. This movie plays into another thread of ancient Egypt-related conspiracy theory: the idea that their technology was so advanced, the pyramids must have been built by aliens from another planet. This entry was posted in Action, Aliens, Lost World, Movie of the Day, Mummy, Sci-Fi, The Original and tagged alien possession, archaeologist, Egypt, hieroglyphics, interdimensional travel, James Spader, Jaye Davidson, Kurt Russell, pyramid, Ra, Roland Emmerich, stargate.